Project SafeCom's 2007 Annual Report is out, and one would expect the usual fare in the publication, however, we've placed the introductory remarks by the Chair, Cedric Beidatsch, on our website here, as well as the short article by Jack Smit, our co-ordinator, because they make for worthwhile reading. In the centre of the storm of planetary changes, so vast, so confronting, that it now captures everyone's attention, there's also talk of vast changes to our way of life, our mode of production, and of many of the core paradigms that bind our society together into a coherent whole. Some of the remarks made below are perhaps somewhat shocking, but they are intended to provide direction, some guidance, and some hints at to what's to come in the next few decades. Another year, with its events, hopes raised and dashed, disappointments and minor triumphs. I write this message with a Federal Election due in six weeks and with the hope that the possibility that Australia's most divisive, deceitful, mendacious and manipulative Prime Minister since forever will soon fall into his political grave. I am old enough to remember a hated Malcolm Fraser weeping on TV after he lost the 1983 election - not that in retrospect Malcolm was that bad a guy, just arrogant, but mainly he was hated for how he came to power ... actually it's only John Howard who made him look good, in reality he was pretty divisive too. I want to see Howard weep the same way, and above all, I want to see him lose his seat, which is entirely possible. Not that I think there will be much to choose other than style and rhetoric between Kevin Rudd and Peter Costello; I do not subscribe to the idea that the ALP is part of the solution, but rather part of the problem. What we need is more independents and stronger minor parties. I also want to express my strong endorsement of the introductory sections to Jack's report. My academic speciality is world-systems theory. This is a perspective that seeks to unite sociological, anthropological, historical and economic history approaches and studies the world as not a collection of independent countries, but as one unified, overarching, holistic and coherent system, which has existed in its essentials for about 500 years. The dynamic of this system is the capitalist world-economy, with its motivating logic being the endless accumulation of wealth through the commodification (conversion into a sellable product) of everything - products, relationships, culture, human interactions. Our analysis is that this system reached its peak in the second third of the twentieth century is now coming apart and will collapse in the next 20 to 50 years, as it hits the ecological and economic limits (nothing left to commodify). This places special obligations on those of us who live now, as the things we do will help to shape the world our descendants inherit, more so than at any time since the first generations of the system in 1450 - 1550. Of course the power and wealth elites, increasingly globally united, will do all they can to perpetuate their plunder of the world, and as resources restrict, will have to resort to more and more force and less and less bribery with the crumbs, to hold power. A form of global neo-fascism, extracting tribute through violence - is a real possible outcome, and there are many who will support that option rather than accept a reduction in lifestyle and greater equality. We live in a time of kairos ,the time that is the right time for change, but also a fearful time, when there will be much suffering and upheaval. How long this time will last, and if it can be curtailed in favour of a better world will require hard work, much activism and sacrifice from all of us. Enough philosophy. In the last year we have achieved some milestones, of which I am very proud. Our finances are sound and increasing. We have commenced a pledge program to pay Jack some income - while still woefully inadequate, it is a start, and I urge all of you to consider a regular pledge  (even $10 per week helps) towards this. We have developed a state of the art, automated financial management system. We have nearly doubled our membership. We maintain our vigorous work in breaking through the media exclusion walls, and Project SafeCom keeps manifesting its voice in the press. We have proven our ability through the timeliness and topicality of our press releases, based in sources not always available to journalists, to both raise and amplify issues. We have developed a trusted and well used website, with an excellent number of visitors. All in all it has been a successful year, and both Jack and the committee deserve congratulations for a job well done. The site is well respected and used among US academics and as a consequence students over there are very well informed - and often horrified - at the policies of the Australian Government towards refugees and practical human rights. On the website, let me share how well respected it is. This year I toured the US for some weeks and spent a delightful weekend enjoying the marvellous hospitality and delightful company of Project SafeCom member Maria Cook and her wonderful husband Lance in Ithaca, New York state - the most beautiful place I have ever seen in the world. Maria is professor of migration studies at Cornell University and uses Project SafeCom's Daily News and Updates as well as our website as a teaching resource. The site is well respected and used among US academics and as a consequence students over there are very well informed - and often horrified - at the policies of the Australian Government towards refugees and practical human rights. Project SafeCom's impact is felt well beyond our borders. Other very worthy milestones of this past year were the World Refugee Day event, for which we received enormous and generous support from the Fremantle Herald in the form of a dedicated wrap around cover, with the promise of a repeat in the coming year. We thank the proprietor Andrew Smith for his support and commitment. We also acknowledge the generosity of the ACT Refugee Action Committee who so readily sponsored Jack's trip to Canberra in March to attend the Manning Clark Weekend of Ideas, and RAC's Jane Keogh's hospitality - as well as her support for a time as our 'remote committee member'. And, not for the first time, our warm thanks goes to Larry Stringer and Liana Christensen for the use of the Scott Street House in South Fremantle as our premises, even as this agreement is likely to come to an end soon. And finally, we recently appointed our very first honorary member, Dr Carmen Lawrence on the occasion of her retirement form Federal Parliament, for her consistent support of our project. I will be stepping down from the chair at the coming AGM, for three reasons. My PhD is approaching final stages and I need to focus intently from here on in; simultaneously my academic career is developing with overseas visits to speak at conferences, opportunities to publish and participation in three international research projects and not least because I personally believe it is bad practice for people to occupy the same position in an organisation for more then two years. It has been a privilege to chair Project SafeCom in this time, to work with Jack and our wonderfully dedicated committee members, and I thank you all for the support you have so generously tendered. Here's to a successful year of promoting meaningful social change! To someone who is prepared to carefully observe population trends connected to economic and environmental developments in Australia, it may rapidly become clear, that on some level a considerable number of autochtone Australian displaced people live amongst us, and, more disturbingly, that the number is on the rise. While Indigenous people living in cities and towns have long been one of the primary groups to experience forced displacement  when suburban property prices become subject to rapid increases with the ensuing effect that rental prices rise steeply, often aided by the boutiquification of walkways, road verges, shopping centres, parklands and public spaces, the phenomenon is now spreading to many other people, and not just to typical single-income or low-income people. The totally mad soaring of real estate prices to exorbitant levels, the fact that rents are 'going through the roof' and that companies offering tenancies are in a luxurious position to demand - even extort - 'extra's' from prospective tenants, has a worst-case scenario effect of many people simply being forced to move to the cheapest areas of cities or towns, or move into country or regional areas. Add to this the real threat that several major Australian cities may be starting to run out of water, and there will be taking place for many people, for many families, a forced internal migration, a forced relocation, an 'internal displacement' in the true classical sense of the word, for environmental and economic reasons. People are being forced to move because of 'capitalism having gone rampant' and because of environmental factors. Add to this the widely expected considerable increase of the cost of public utilities such as water and electricity when we start adding the cost of carbon pollution, and our nation's cities may well find themselves quietly developing into communities that exhibit a range of serious core problems in their social functioning. This introduction to our 2007 Annual Report is intended to do a couple of things. Firstly, it hopes to focus your attention on to some new factors that contribute to the making of refugees and displaced people - and there's perhaps no better way to do this than to lead you into our own backyard rather than to point to a country other than Australia, and immediately talk about refugees over there than about refugees over here; secondly, it intends to stress that environmental factors in a capitalist society, driven by lots of financial greed and its connected agendas, may well more frequently than we expect form the foundation for the making of refugees and displaced people in the 21st century; and thirdly, it hopes to also focus your attention to the way Project SafeCom was set up, the way its particular vision, direction and mandate has been formulated. Just last month the opportunity arose to redefine our vision when the Refugee Council of Australia asked for a summary - you can find this definition in Appendix 1 at the end of this Report. Project SafeCom clearly is not a party-political organization, but this has never had major implications for any form of silence or toning down of our vigorous government critique. Under John Howard the Liberal Party has been dominated by his personal stamp and small-minded and controlling policy directives, and we all know how most, if not all, policy initiatives under his government contain some shocking wedges, how by far the most of them pit different population groups up against each other, and how all of them split asunder population unity in our country. 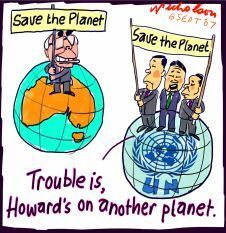 Perhaps the fact that the coalition government's environment and climate change policies carry such a strong underlying mantra of 'climate scepticism' - as per usual in tandem with the US Bush Administration - will be an important part of the undoing of Howard's reign. It is essential that Australia in its precariousness over climate change issues is governed with great care and compassion by politicians with great wisdom, politicians who display a deep connection with the issues so clearly outlined in a rapidly growing number of scientific climate status reports, and with an honest set of policies that pro-actively promote social equity and justice platforms, and, in the context of financial ruin for many Australians as a result of internal displacement, that these policies contain a significant aspect of income and wealth redistribution to assist the many of us who will be seriously affected. While it seems that most of the world has already declared a planetary emergency (I used these very words at the e-launch of our Climate Justice flyer ), Australian politicians of the major parties, similar to many other countries' governments, have largely failed to see the issues this plainly and openly, let alone start an appeal to the population to reach out and assist. It is however only when this happens, when we learn to 'hold' - in the sense of the word 'behold' - the danger the planet, our very own world, finds itself, and learn to hold this realisation, and when we can also be assured that our country is governed by our parliamentary representatives with the greatest of care, a great deal of compassion and a great deal of mercifulness towards those who will be affected, that we once again learn to develop a sense of wholeness in relaxation, and learn to restore the sense of compassion and inclusion we so urgently will need to care for those in our own country as well as in the rest of the world who are displaced, and for those who need our help, whether they knock on our doors or not. This state of balance could be called the inclusive society, and I believe that nothing less than this consciousness is what we need in the next 4-5 decades, where we are bound to experience, as well as witness, massive disturbance, a great deal of dislocation, many scattered or vanishing communities, and a great deal of deep, deep distress on the part of the world population. In the last decade we have experienced just a few days where the inclusive society was activated, strongest during our response at the end of 2004 to the Asian earthquake and the ensuing tsunami in Aceh, when we spontaneously gave many millions of dollars, because it was the only thing we could do. Perhaps we also had a similar experience during the Sydney Olympic games' opening ceremony, where we showed so proudly of the best of Australian talent and Australian culture, or in the weeks following the Beaconsfield mine disaster in Tasmania - but just some moments of this beautiful collectiveness is not enough to keep filling us. The fact that we have experienced such a long period of 'materialistic, individualistic, excluding, manipulating, and mean-spirited' government under John Howard is one of the main contributing factors to the spiritual desert we have experienced in recent years; we may be well burnt out in our 'democratic enactment spontaneity', and our skills to respond appropriately to injustice may well have worn out. Recently someone suggested that he was bullied a lot during his school years, and my conjecture tells me, that if this is so, he learnt very early on to split his enemies into two camps by introducing an argument they would fight about, so they would divert their energy away from their original target and start attacking each other. That's my fantasy of John Howard's modus operandi, the wedge policy he has tried on our country, time and again, not born from mature wisdom and a desire to build our nation, but born from determination and coping strategies as a bullied, not overly bright, but very smart child. My deepest desire for Australia as a nation, is that she gets a leader, a team, or a group of leaders, who unite us, build us up, and heal the scars inflicted on its psychological and social landscape. The sooner this happens, the better it will be for me, for you, for the nation, and for the rest of the world we engage with. Kairos (Καιρος) is an ancient Greek word meaning the "right or opportune moment". The ancient Greeks had two words for time, chronos and kairos. While the former refers to chronological or sequential time, the latter signifies "a time in between", a moment of undetermined period of time in which "something" special happens. What the special something is depends on who is using the word. While chronos is quantitative, kairos has a qualitative nature.